Years ago, my partner Jim (his real name) and I went to Northumberland and stayed in a very, very remote cottage for a week. We took with us our young weimaraner, Hobbes. She was in doggy heaven; tremendously long walks over the hills, snoozes by the aga and haring around the large garden flushing out pheasant and rabbits. Such fun. Jim and I joked about her brain arcing with the excitement of it all. Bzzzz, bzzzz, bzzzz. I was reminded of our week’s holiday in Northumberland this week by my brain bzzzing. It’s the light, I tell you. The light. There is simply too much input, too much stimulus. Too much damn beauty. Bzzzz. Bzzzz. Bzzzz. 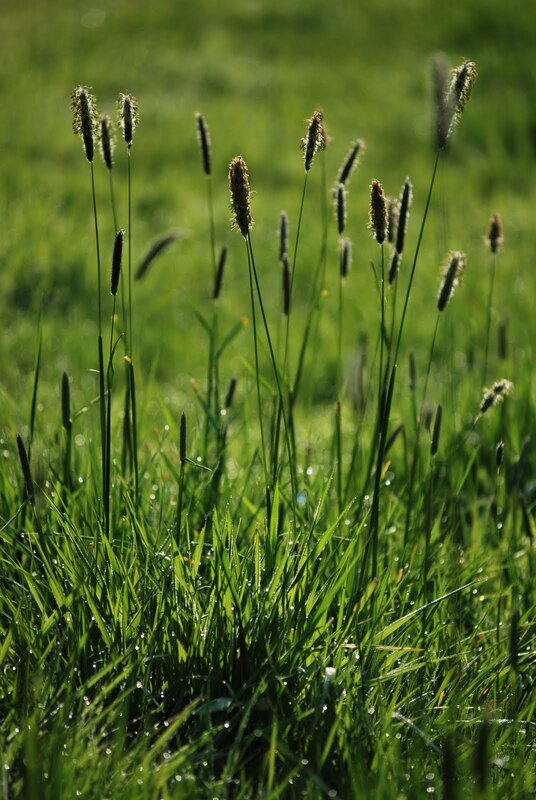 Over in the meadow, the grasses are beginning to do what grasses do when you stop mowing them. Er, grow. And even the weeds take on an ephemeral charm, a beauty that all too often goes unappreciated; at least by me. 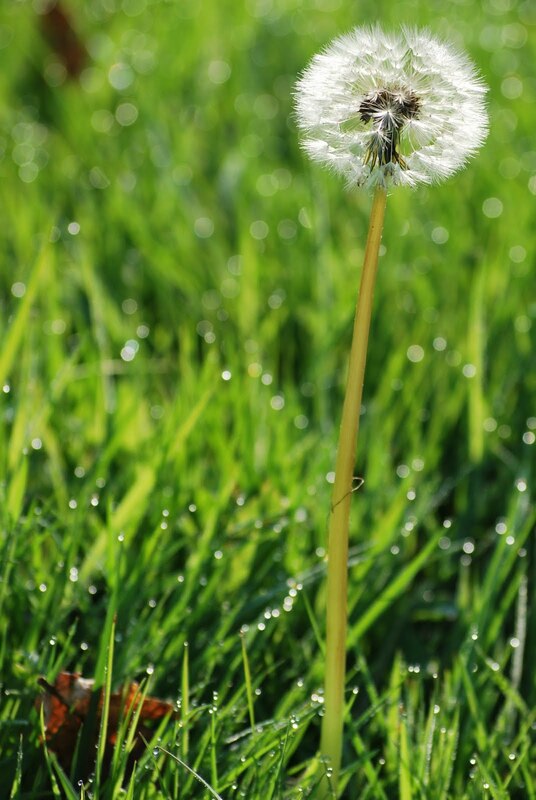 How often have you been irritated by a dandelion seed head growing in a crack of paving or in a border? But here in the meadow, they just look lovely. 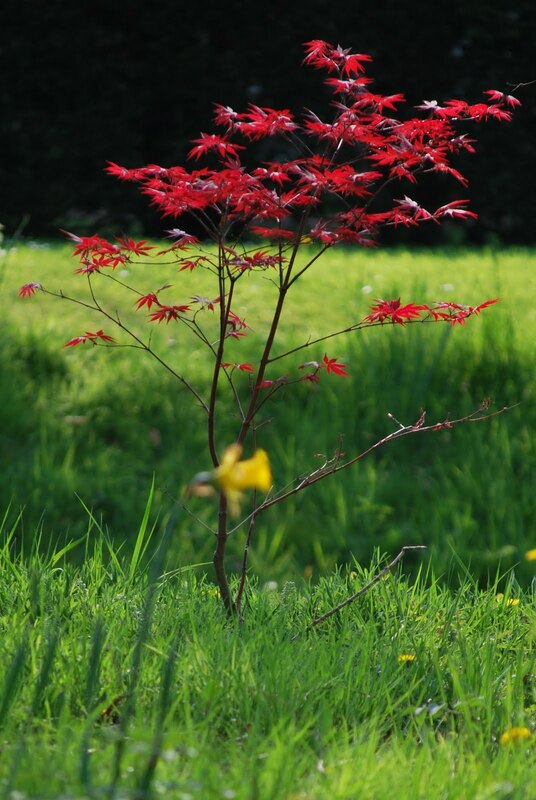 Last year, out on the island in the west pond, I planted four Japanese maples. Three are looking great and coming into leaf but one is looking a little sorry for itself. I shall need to haul on my waders and go and investigate. I like my waders. They’re just like an enormous romper suit. And make me laugh. 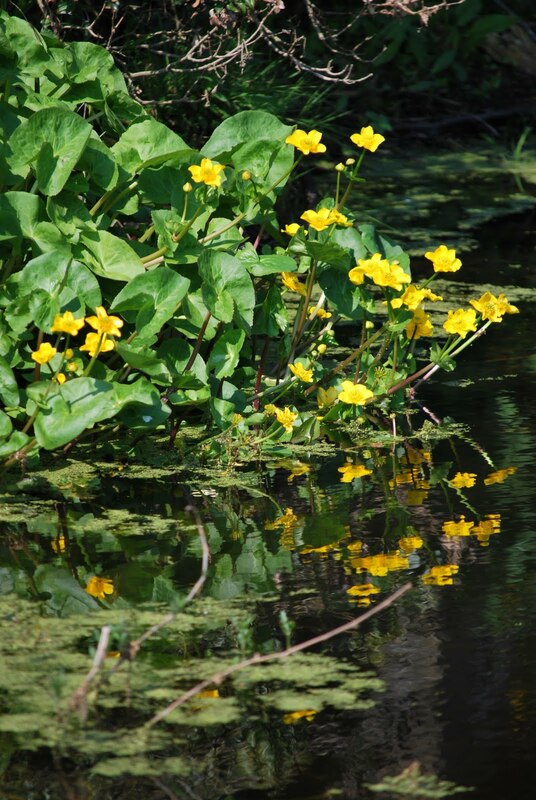 I introduced some kingcups into the garden the year before last. They are now getting established around the east pond. Tried to get a close up shot but it was ruined by this pesky damselfly. 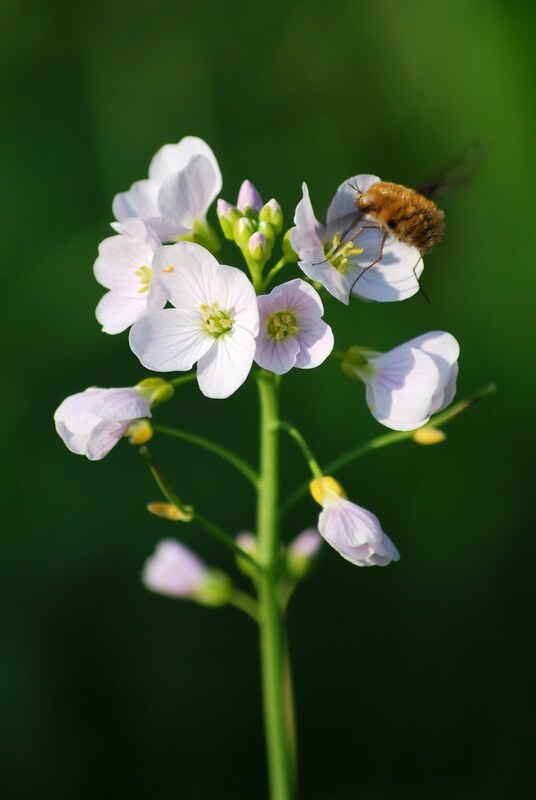 Tried to get a nice little shot of a lady’s smock but this bee fly got in the way. 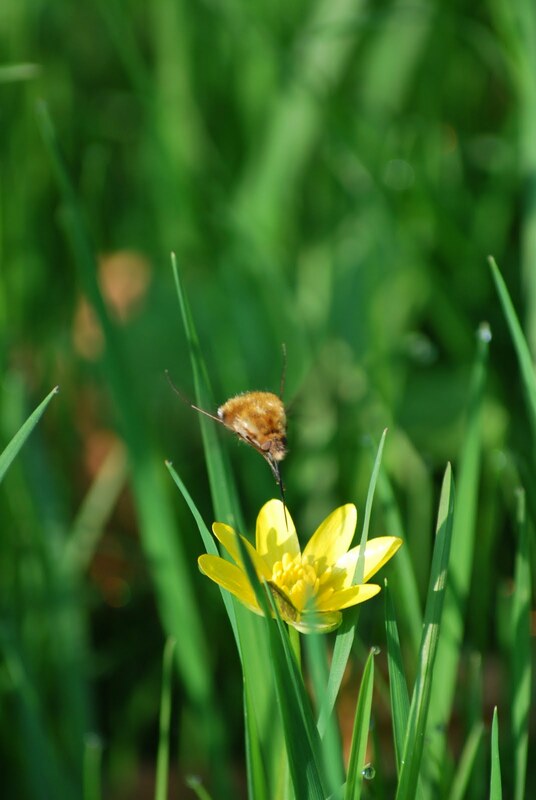 Tried to get a nice little shot of a celandine but ………. good grief. The light makes it all so photogenic. (Even if there are no plants involved). But I was soon drawn back to some pretty flowers. This is Phlox kimono. A terrific little plant that flowers its heart out for weeks on end and is just so relentlessly cheery. But not in an irritating way. Clematis. 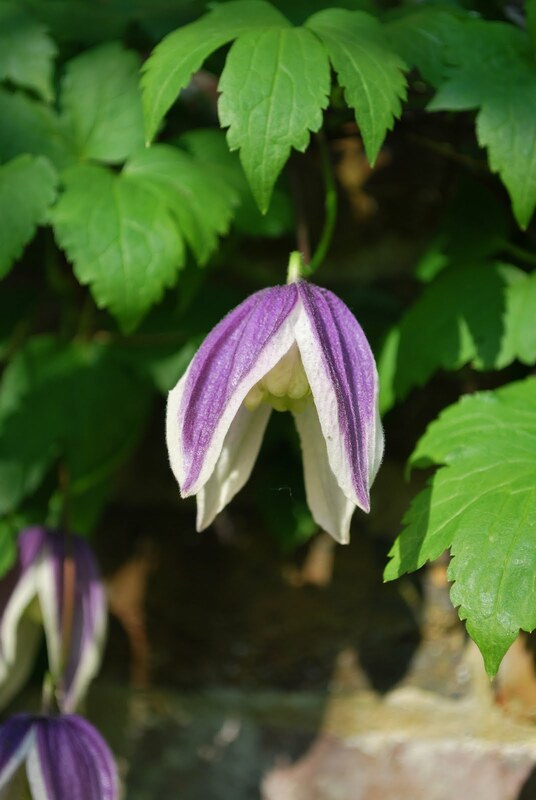 Wouldn’t you just die without clematis? 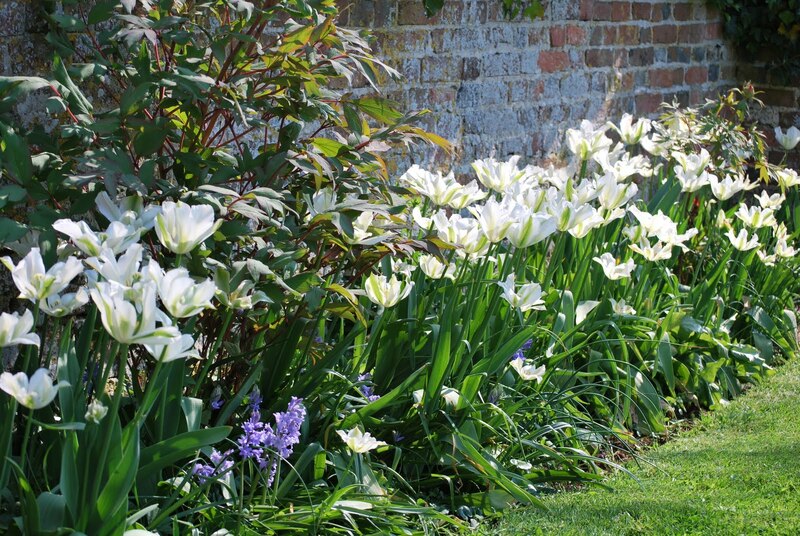 Probably not but I do adore them and have planted over a dozen at the Priory. This is the first to flower this year. Still lots of hot tulip action going on. 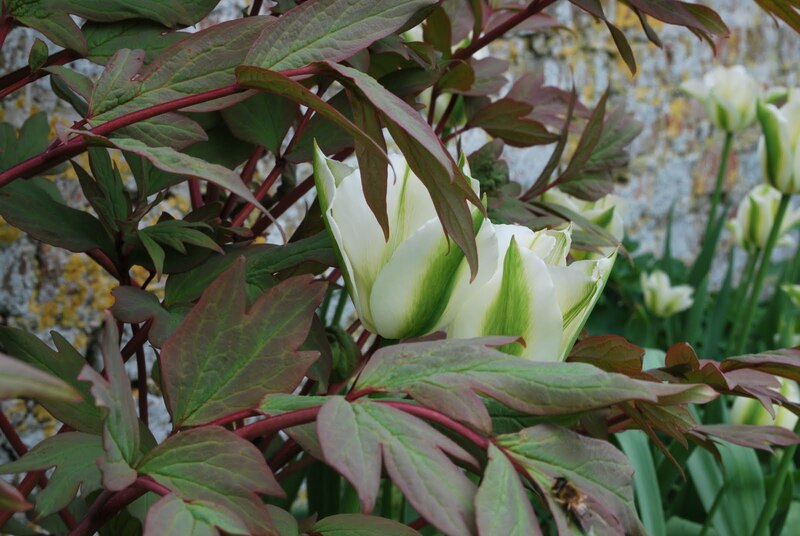 Here’s tulip spring green. I’ve made a mistake here; its subtle colouring is a bit lost against the wall. They’d be better against a dark background. But in the mornings, before they’re leached out by the sun, they look better. Honest. You must believe me. You simply must. And year by year, they increase in number so they’re obviously happy; which makes me loath to move them. 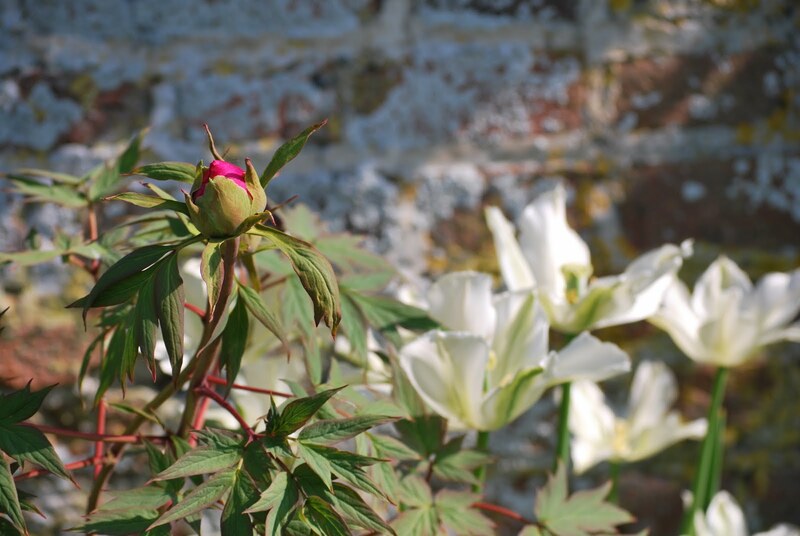 Here it is being a little coquettish behind the leaves of a peony – non-leached. There are three tree peonies in this bed. I call it the tree peony bed. (I’ve always been very good at naming things). All were strimmed (wince) during the-years-of-neglect. They’re terribly slow growers but they are recovering though terribly, terribly slowly. And here, the smallest is about to flower for the first time (since I’ve been here). Ever so exciting though I wish she’d get on with it. Talk about keeping me on tenterhooks. Saucy minx. Looks a bit like Audrey II actually. Perhaps she is a he. 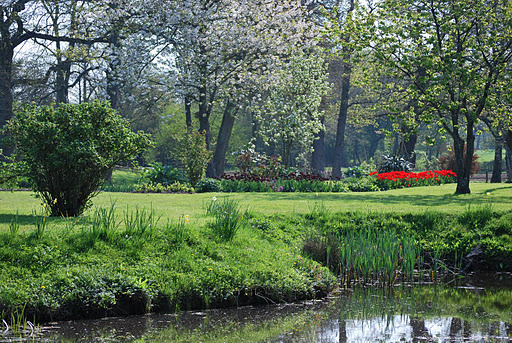 Yet another shot of the long borders with the red gash of Apeldoorn. They’ll soon be over for another year so we might as well make the most of them. Same argument for Queen of Night. Say good night now, Queenie. Good night. (That one’s for you, Shirl). And Hobbes? Well, she’s an elderly, sedate but rather lovely old dog now. Not capable of long ranging walks anymore, she spends her days lying in the sun and then looking at chickens. She can spend quite a lot of time looking at chickens. And sniffing them. She doesn’t really understand why she mustn’t bite them but she tries very, very hard indeed not to. Kimono is smashing, Karen and this has reminded me that I didn't take any cuttings – sigh. Where's the last few months gone? Wonderful spring photos. It takes me back…. 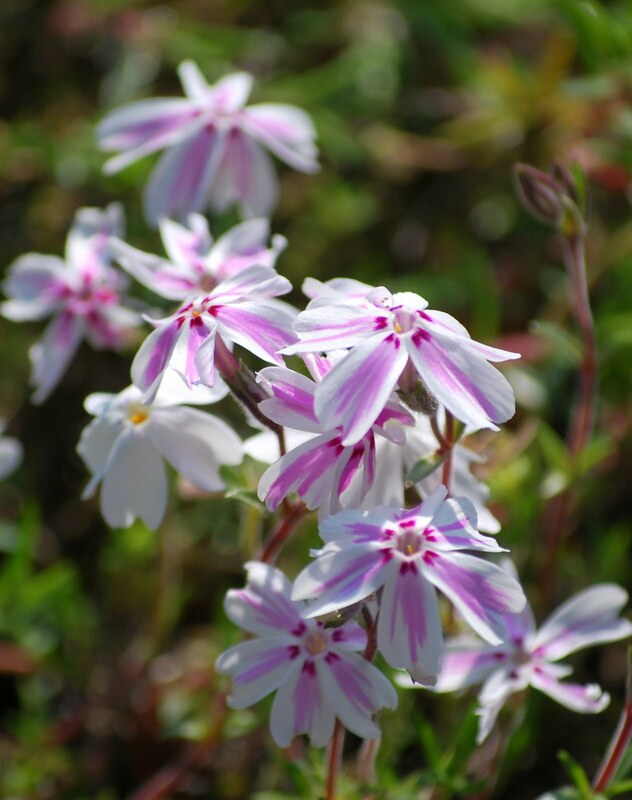 I particularly like the one of the phlox. Very choice. Thanks Karin, very nice of you to say so. Hi Sara, pesky is as pesky does (don't know what that means either). Lovely photos. 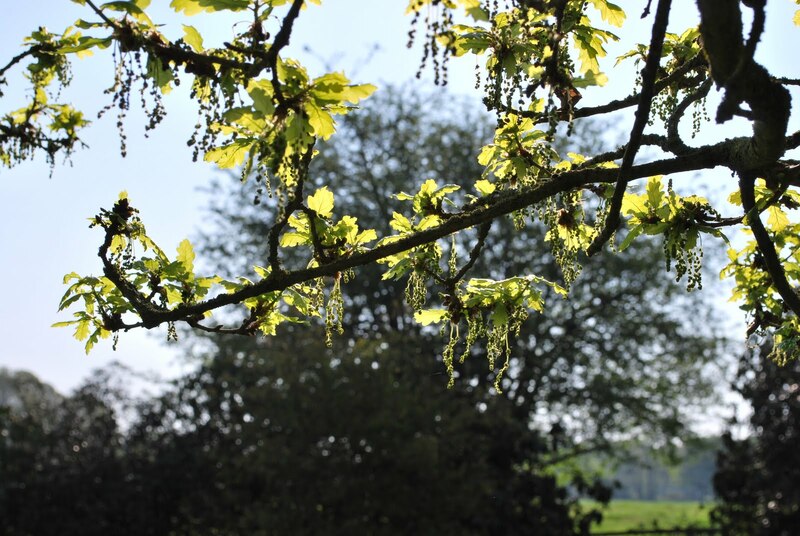 You clearly have some beautiful plants in your garden as well as an eye for a good photo. 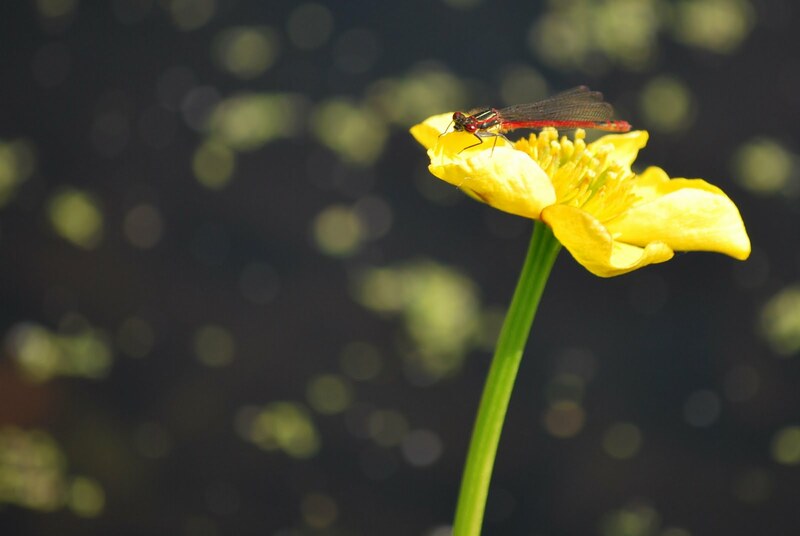 I particularly like the damsel fly on the kingcup. Hi Shirl, Hobbes generally makes me smile. Most of the tulips are now sadly over following this long hot weekend. Hi Stacy, we're not far behind you on the comfortable light front. 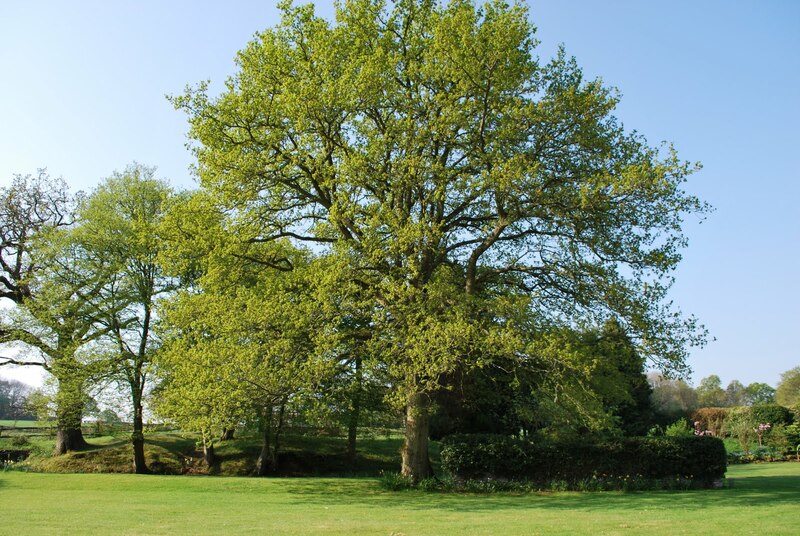 No rain in weeks and the green is already looking a little tired in places especially on the lawns. 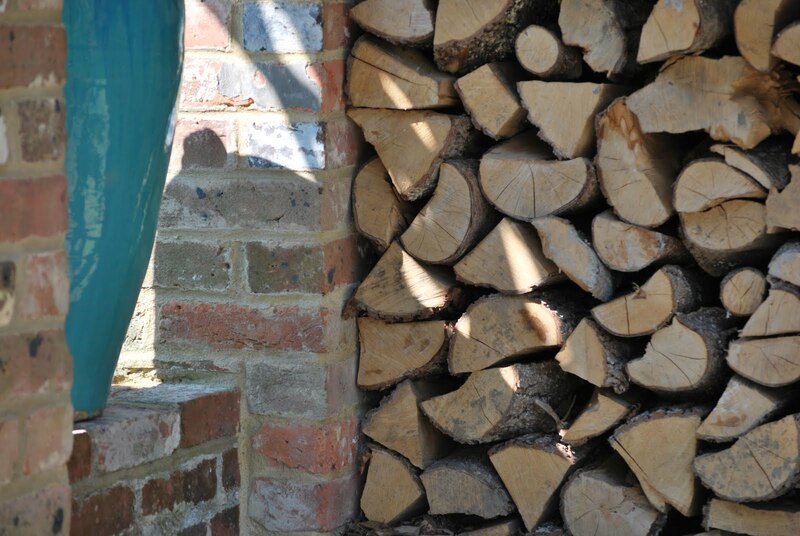 Have to keep on reminding myself it's still only April. Hi Janet, meant to go back to Northumberland but never have. Perhaps this year. Hi Julie, thanks for the suggestion. There is already ivy growing on the wall so in time the problem will solve itself. 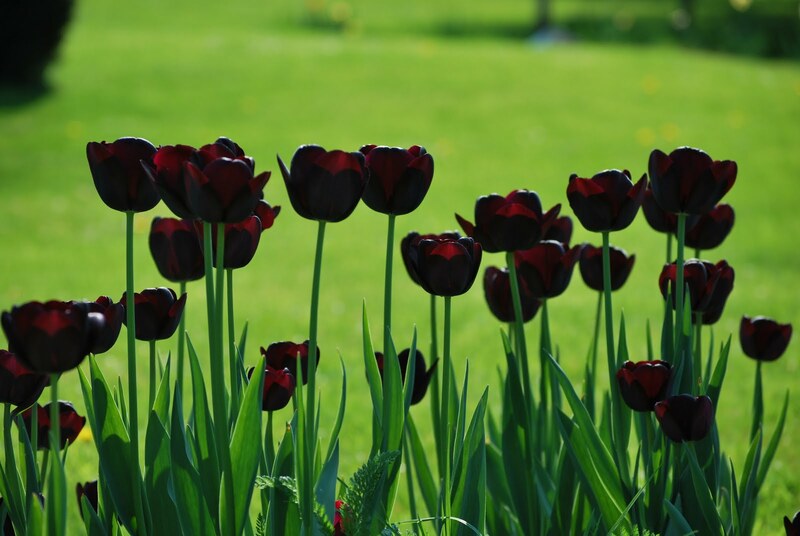 While reading over my shoulder about your white tulip problem (if it can be called that when they are looking so nice), my excellent hubby suggested you plant a creeping evergreen up that wall to help you see your tulips. No room for shrubs, but that just might work. I think he is brilliant of course, so I could not resist suggesting it. And I agree about the beauty bit. We need our buzz also. There's something touching about gray-muzzled dogs who have grown resigned to the Not Eating of Chickens (and all the other mysterious bans we impose on them).